Teenage Mutant Ninja Turtles (2003) season 3, part 1 review – AiPT! No time to waste, let’s jump right on into the third season of the 2003 Teenage Mutant Ninja Turtles cartoon produced by 4Kids. I’m in a hurry to get to these episodes, partly because I remember them being very good, but mainly because this is the season that introduces the show’s best original villain: Agent Bishop. I have been dying to get to his episodes since I started this article series. Season 3 has a lot of the sci-fi, outer space stuff that season 2 dwelled on, so you’d think I’d hate this run, but the truth is, it doesn’t drag those storylines out the way season 2 did. What helps is that these alien-centric, multi-part storylines are all original, rather than comic adaptations, so the pacing feels more organic. And the sci-fi stuff is kept mainly terrestrial throughout the season, bringing the aliens to Earth rather than the Earthlings to the aliens. That alone makes it more palatable to me. But before we can get to the aliens, we’ve got to get through Christmas… which still is somehow about aliens. It’s Christmas in New York and Michelangelo’s holiday is having its ups and downs. On the bright side, he’s just adopted a new kitty named Klunk. On the down side, he has to deal with the Purple Dragons who have hijacked a shipment of toys intended for the local orphanage. While I normally follow the episode order from Wikipedia when I do my reviews, I had to make an exceptions for this episode. It was the first to be produced for season 3, but was broadcast in the middle of the season so that it would air closer to Christmas. That makes sense from a distribution standpoint, but from a narrative angle it actually messes up some of the continuity. The main offender is the portrayal of the Ultimate Diamyo in this episode versus how we’ll see him toward the end of the season. I don’t want to spoil that arc before we get there, but watching this episode so close to the season-ending multi-parter creates a bad continuity error. Really, “The Christmas Aliens” belongs at the start of the season. Not just for continuity’s sake, but because it actually feels less like a season premier and more like an epilogue to the previous season; as sort of a light follow-up to “The Big Brawl” arc. Since the 2003 cartoon is so heavily serialized and episode-to-episode continuity is actually very important for this show, let’s just watch this episode now. “The Christmas Aliens” is an adaptation of Eastman and Laird’s Michelangelo (microseries) #1, while also incorporating a brief moment or two from another Christmas-set issue, Leonardo (microseries) #1. As an adaptation, it’s very faithful but still manages to incorporate elements exclusive to the 4Kids TMNT mythology into what was originally an early Mirage universe story. There’s a lot of saccharine mush in this episode. Mikey adopting an adorable kitty, saving toys for orphans, Splinter and the Turtles dressing up as Santa and his elves to deliver the toys to the good girls and boys… Yuck. But guess what? All of that stuff came straight from the comic. The same one where people got their faces chopped off. While it’s all very sweet and cavity-inducing, you can’t blame it on 4Kids. What they do add to the story to better work it into the tapestry of the animated series is cameos galore from previous allies. The Ultimate Daimyo, Usagi and Gen from “The Big Brawl” appear as guests for the TMNT’s Christmas dinner. But there are more obscure one-timers, like Angel from “Fallen Angel,” the bums from “Garbageman,” and Silver Sentry from “The Unconvincing Turtle Titan.” It’s another reason why I feel like this episode rubs off more like a season finale than a season premier. The story is a light break after a lengthy adventure and offers return performances from the recurring characters we’d met throughout the previous two seasons. Michelangelo saving the toys from the Purple Dragons is the A-plot and gets all the best animation, but I found myself more drawn to the cutaway antics at the Christmas party in the lair. Casey is at his most obnoxiously bumbling (he won’t get his edge back until season 4), but the gags are fun and we get to see everyone hanging out and having a good time. The bit where Raph trims the tree with butterfly knives is taken straight from the Leonardo one-shot, and it was cool to see that scene brought to life, but I think my favorite bit was Usagi and Leo exchanging gifts (they both got each other swords). There’s also a small moment where Splinter communes with the memory of Hamato Yoshi via the sensory orb the Utroms gave him in “Secret Origins.” I’d forgotten all about that thing. And the new character introduced is Klunk! Yes, Klunk. He’s the TMNT’s pet kitty from the Mirage comic. He never really did anything other than hang out and be a cat, but you know what? You’ll miss him when he’s gone. This episode also brings in a new animation director. Roy Burdine replaces Chuck Patton and will direct every episode for the remainder of the series. His style remains consistent with Patton’s and you probably wouldn’t have even noticed the change if I hadn’t pointed it out. He does most of the same things Patton did, like using split-screen layouts to create a comic book panel vibe (he actually does that even MORE than Patton did). The animation on this episode, in particular, is very, very good. There’s a moment where Mikey confronts the Purple Dragons as they steal the toy truck and he straight up pulls off a hurricane kick from Street Fighter II. It looks phenomenal (if a little ridiculous). There’s also a digital snow overlay throughout parts of the episode, which makes the screen look a little busy, but is actually consistent with the Mirage comic (which had a LOT of snow-speckling throughout the issue). The Triceratons have followed the transmat signal across the universe and back to Earth. They still want the Fugitoid in order to wipe out their enemies, the Federation, and a full-scale planetary invasion begins. When April and Casey are captured, the Turtles have to save them before they’re taken away. One of the reasons I think season 3 was a major turning point for the 4Kids franchise is that from this point on, the show’s milestone arcs will no longer be direct adaptations of Mirage comic storylines. Yes, there will still be adaptations, but mostly for the one-shot adventures. The BIG storylines will be entirely original. Chalk that up to the series having blown through most of the major Mirage plots in its first two seasons; they didn’t have a choice BUT to come up with original storylines at this point. What helps is that the original lynchpin multi-parters that will define the series arc for the next few seasons are all very good. Yes, good storytelling always helps. And believe it or not, but the idea of the Triceratons invading Earth is something Mirage never did, despite it seeming so intuitive. Closest the comic ever got was TMNT (Vol. 2) #12Â where a small group of Triceratons follow the transmat signal to Earth and then all die in a fireball. TMNT (Vol. 3) #19 did begin a storyline where the Triceratons come to Earth in larger numbers, but as a commando mission and not an all-out invasion. TMNT (Vol. 4) #5Â had the Utroms arrive on Earth and cause a global panic, but it was a diplomatic mission and not an “invasion.” Nope, this incredibly obvious follow-up to the outer space adventure storyline is a 100% 4Kids original. The first thing you might notice about this episode is that it takes itself very, very seriously. The first act has no levity to speak of; no jokes, no slapstick, nothing cute or fun. Just the Triceratons raining death from above on all the military installations of Earth while civilians run screaming through the streets as alien troops storm through. The grim attitude makes this an even better follow-up to “The Christmas Aliens” and all of its schmaltzy holiday joy. We just went from “the Turtles dress like elves and give toys to orphans” directly into “alien dinosaurs shoot everybody.” I love it. This storyline also puts the Turtles in over their head. Way, way over their head. We’re so used to watching them save the day that it’s rather sobering to see them cower before an invading army with no idea what to do. They’re heroes, but they aren’t SUPERheroes. There’s a great moment where Leo admits that he doesn’t know how they can do anything to stop the Triceratons, but settles on helping a little old lady that’s being taken captive. Even if they can’t save everyone, they’ll save SOMEone. The last act is a rescue mission to try and free April and Casey from a holding pen in Central Park. It adds a bit more structure to the story, which was pretty wild for the first two acts. Casey is again portrayed as rather pathetic, but in this case it isn’t due to any comic relief bumbling on his part, but rather that he’s no match for a 9-foot alien dinosaur in battle armor. Fair enough. Donatello is taken prisoner by the Triceratons and brought back to their mothership for questioning. To save him, the Turtles will have to figure out how to get to outer space. Meanwhile, Prime Leader Zanramon and Commander Mozar up the stakes, raising Beijing from the planet’s surface as a show of force against Earth’s military. Before I go any further, I just want to mention that this episode has one of the best cold open/storyline recaps in the whole series. It’s done as a Triceraton propaganda newsreel, complete with a faux-1930s newscaster doing the narration. While the 4Kids show was never very good at humor (sorry, but it’s true), this was one gag they absolutely nailed. Another moment worth mentioning is that Mikey totally kills a Triceraton in the first few minutes of the episode. He pulls the pins off of the grenades on the Triceraton’s bandolier and that’s the end of that fucker. Nice thing about having “monsters” as enemies in Saturday morning cartoons: BS&P is willing to look the other way when you kill them on-screen. During the scenes where the Earth forces are shown mobilizing against the Triceratons, we’re greeted with a new incarnation of the Justice Force, changing the roster from the retired version seen in “Return of the Justice Force.” The ranks now include established heroes Silver Sentry, Ananda and Metalhead, as well as generic newcomers Tsunami and Chrysalis. They… don’t do much and get taken out immediately. I mentioned it a few reviews ago, but by introducing a stable of superheroes to the universe, it means that every time there’s a massive crisis-level threat, the show is now obligated to address the question, “Why don’t the superheroes just take care of it?” It gets old. As for the Justice Force, we’ll be seeing them a few more times throughout the series and their roster will change up a bit. And speaking of “what is so-and-so doing during all of this?” we get a glimpse of Shredder and Karai, observing the nuclear strike on the Triceratons and waiting to see what happens. Oh yeah. The Foot Clan. They used to be important, didn’t they? The BIGGER introduction in this episode is the rather inauspicious first appearance of Agent Bishop. He was hinted at last episode, as a pair of Earth Protection Force members were shown talking to an unseen individual while monitoring the Turtles in Central Park, but this is his big reveal. Here, he’s only seen in the shadows, taking a phone call while hanging out at the UN Building. He may not seem like much now, but he’s gonna be the best villain in the whole series. Oh yeah, and weren’t the Turtles in this episode? The B-plot winds up being way more exciting, watching the military and various other forces try and deal with the Triceraton invasion. It makes the TMNT’s rescue mission to get to the mothership and save Donatello fall by the wayside. If anything, IT feels like the B-plot, as it mostly involves the Turtles cruising around in a Triceraton fighter, trying to get a reluctant commando to fly them to outer space. The Turtles arrive on the mothership and join Traximus, Monza-Ram and the Triceraton Rebellion in rescuing Donnie. Meanwhile, as Zanramon begins levitating New York City, Agent Bishop makes a deal with an unseen individual. This episode puts the Turtles back in focus as they make it to the mothership and begin formulating a plan to rescue Donnie. It also ups the stakes on their end of the fight, as they also finally come up with a way to save the Earth. So far as pacing goes, “Space Invaders” is nicely plotted in a way that gradually brings the Turtles into the conflict and ups the ante for them with each episode. First they’re pretty much just running around in a panic, then their objective is to rescue Donnie, and lastly they find a way to save the whole planet (with help from the Triceraton Rebellion). I have less to say about this episode because it really isn’t a conclusion to the storyline, but a midpoint in it. As such, it doesn’t actually resolve anything other than getting Donatello back home and buying the heroes some time until the Triceratons rally. During the run of the 4Kids TMNT cartoon, there were three different sets of shorts. I already reviewed the Dong Woo series, and now I have the… “privilege” of reviewing the Flash-animated series. Lucky, lucky me. In concept, these shorts don’t seem so bad. They’re out-of-continuity comedy routines putting the Turtles in zany situations. The things are corny in their humor and definitely aimed at younger kids, employing cartoony effects like dust clouds when characters run away or (extremely limited) squash-and-stretch physics. But as 1-minute filler segments on a Saturday morning, there’s nothing that bad about them. But good lord, the animation is s--t. The mid-2000s weren’t very kind to the Flash animation platform, which made the creation of cartoons cheaper and quicker than ever before. For several years, it seemed like major corporate animation studios were pumping out Flashtoons that looked every bit as awful and amateurish as the stuff you saw on Newgrounds. These TMNT Flash shorts are of that era. The Johnny Test era. They look baaaaaad. I’m limited to what I can find online when it comes to chronicling these things. Unlike the Dong Woo shorts, none of these were ever released on DVD as bonus content. They only ever aired during the original broadcasts of the 4Kids cartoon on Fox, too, so if nobody taped them at the time then they’re gone forever. About 20 minutes-worth of these shorts have survived and made it onto You Tube. And you know what? 20 minutes is more than enough. The “plots” of the shorts are a droll setup and punchline technique. Like Raph is knitting something to improve his hand-eye coordination and Mikey is laughing at him for being a wuss. But then it turns out Raph was knitting boxing gloves which he uses to beat the s--t out of Mikey. Ha-ha-ha. 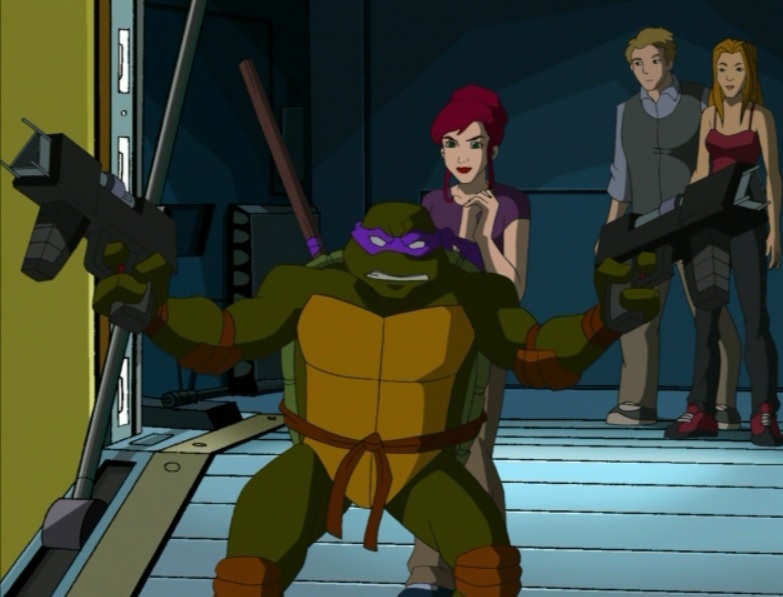 Or Mikey is looking for his new pet, Fifi, and Raph starts laughing at him for having such a wussy pet. Then Fifi turns out to be a mutant blob monster that beats Raph up. Ha. Ha. Ha. That’s as ambitious as these things get. Some of the shorts are intended to advertise Playmates toys, like the Paleo Patrol (which teamed the Turtles up with dinosaurs) or the M.E.C.H. Wreckers (which put the Turtles in Aliens-style exo-suits). I’m actually okay with using these crappy shorts for toy promotions, as it kept more of that s--t out of the actual TV series. Think of these Flash-animated shorts as something like a trashcan for all of Playmates’ bad ideas. That bit of filler out of the way, I’ll conclude by saying that season 3 gets off to a heck of a start. If I’m recalling it correctly, the series also keeps that momentum going right on through the fourth season. Seasons 3 and 4 are the best of the best when it comes to this show; I’m actually quite anxious to revisit these episodes. I’ll try and get the next batch out soon. Lots of Bishop and Leatherhead in those, and that’s always something to look forward to.